While woodpeckers may be attractive additions to your backyard, their eating habits can be a hindrance to your home. Try these solutions to ward off the noisy birds. 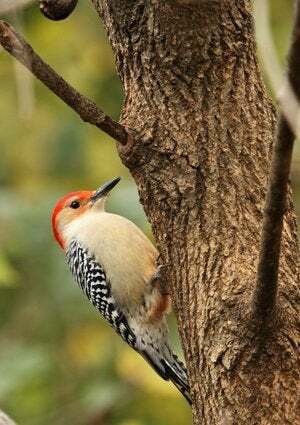 As pretty as woodpeckers are to observe in your backyard or garden, these noisy birds can cause major damage to your trees and wooden structures if left unattended—not to mention, their constant drumming can be extremely disruptive to the peace and quiet you need to be productive around the house. Prevent woodpeckers from taking over your outdoor space with these tips for handling the winged troublemakers. You’re most likely to hear woodpeckers in the spring, during their mating season. That’s when the medium-size birds are usually most active—and noisy—drumming to attract mates and mark their territories. The hallmark pecking will aid you in locating where a bird’s nest might be and therefore usher them out of your backyard. To get rid of woodpeckers that have already made themselves at home in your yard, it’s best to use a technique that will scare them off. Always avoid solutions that could harm woodpeckers, such as sticky substances that trap the birds. Instead, use one of these four ideas that have been proven to help ward off woodpeckers safely. 1. Hang up a shiny object. A mirror (or aluminum foil if you’re in a pinch) near the spot where a woodpecker has made its home will show the bird its reflection when it returns, startling it and potentially scaring it away from the area. 2. Set up a wind chime or a pinwheel near the spot. The noise or motion these objects make in the wind may fool your woodpecker into thinking a predator is near and deter them from coming any closer. 3. Set up a pretend predator. Because owls prey on woodpeckers, artificial decoy owls often serve as effective deterrents. You can purchase readymade decoys on Amazon, at home improvement centers, and many local garden stores. Opt for ones with reflective eyes, which look more realistic. 4. Spook them with noise. This last simple deterrent (no purchase necessary!) only requires you to clap your hands, whoop, or make another loud noise to frighten the bird off if you’re outdoors and you see one. 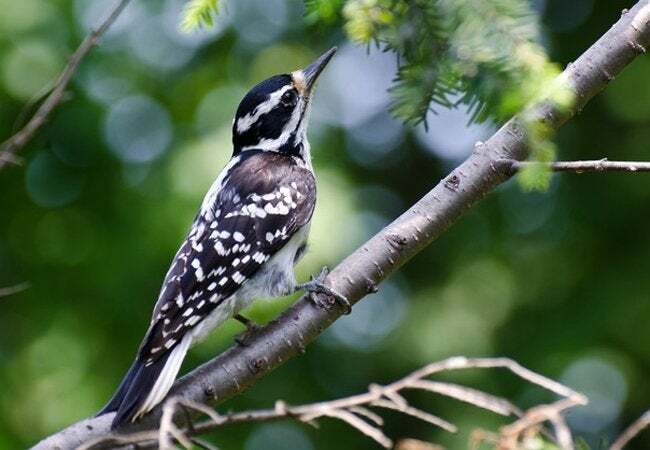 Even if you successfully scare the woodpeckers away, the fact that these birds are frequent visitors to your yard could be an indicator of a bigger problem: an insect infestation. Do some investigating to see if carpenter ants, carpenter bees, or termites are present in your yard. If so, treat the infested trees with an insecticide that is specifically made to kill pests without affecting other animals or the trees themselves. Stay inside while the insecticide goes to work, as the chemicals can be harmful to children and pets. Then, plug up any hole made by wood-boring insects. This will trap them deep inside the tree so they will die off, and other members of the colony will not be able to enter the structure easily. Not only will this process rid your property of unwanted insects, it will also keep woodpeckers from returning to your yard and causing any further damage to your home.